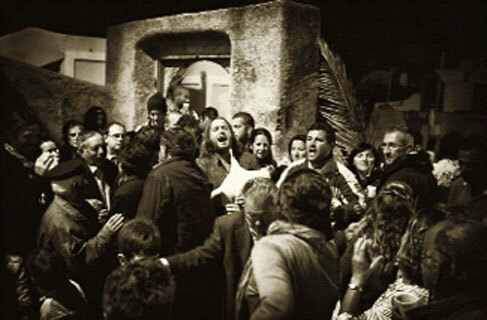 Attending one or more ‘panigyria’ (as local religious feasts are called in Greek), offers an excellent opportunity to experience how the Santorinians celebrate the Saints of the Orthodox Church. We have noted down all important dates and information. 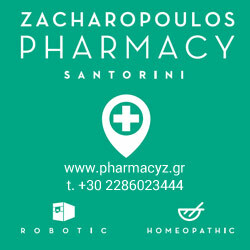 Info: Located along the road connecting the village with the Red Beach, the big church is dedicated to St Epiphanius, who is the Patron Saint of Akrotiri. 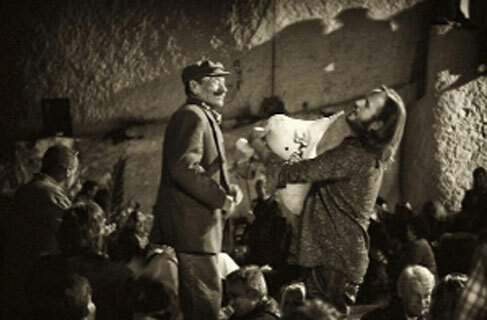 The feast takes place in spring. The church is decorated with many flowers, creating a particularly delightful atmosphere. Food: On St Epiphanius’ Day there are always fava beans (yellow peas), caper, sardines and olives served. According to the traditional legend, someone once promised meat to the Saint but, a few days before the feast, all the calves died. That is why the feast menu strictly features fava accompanied by the above mentioned. Highlight: On the night of the feast, a traditional dance festival takes place with dancing groups from all over Greece. Info: The great feast of the central Church of Megalohori with the cobbled yard, offers an excellent opportunity to visit the traditional settlement and follow the litany/procession of the icon around the picturesque alleys of the village that has remained untouched by time. Food: On Sts Anargiri Day, all visitors are served with ‘kokkinisto’ (casserole meat and potatoes in tomato sauce). Highlight: The Cultural Association of Metohi organises many events where players of traditional instrument gather and play music starting on the feast eve. As is well known, Megalohori has a long and rich tradition in instrumental music. Food: The menu –more frugal than in other feasts– includes bread, cheese and olives. Highlight: Attending the evening prayer when all clergymen of the island, headed by the Metropolite Bishop, participate. On the feast day, harmonious choir chants create a devout atmosphere. 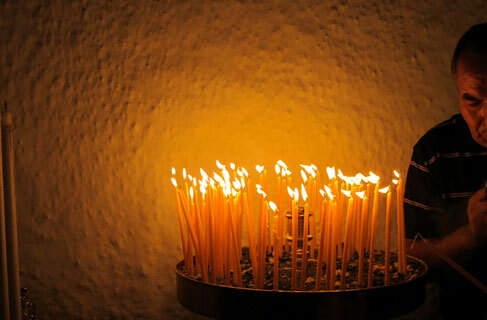 If you do not wish for the formalities of the Monastery, you can go to the Chapel of Prophet Elias in Imerovigli. To find it, head towards Oia and turn on the left at the tavern ‘Iris’. 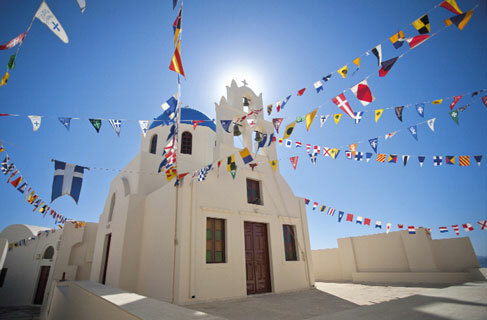 It is one of the most beautiful chapels on the island overlooking both the caldera and the eastern side of the island. 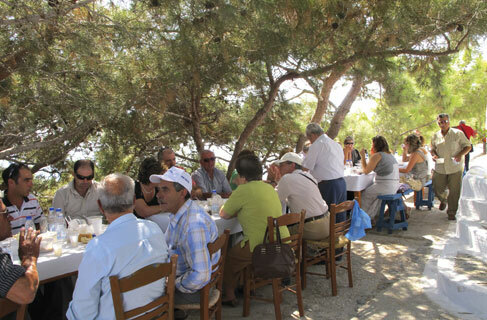 Sitting in the shade of trees, you can savour fava, caper leaves, olives and plenty of wine. Info: Hidden in a cave in the caldera –located between Oia and Imerovigli– this is the sailors’ favourite chapel, approached only in boats departing from Athinio, Ammoudi or Mesa Gialos, on the feast eve and feast day. Food: There is plenty of fava served during the feast, prepared from the previous day. 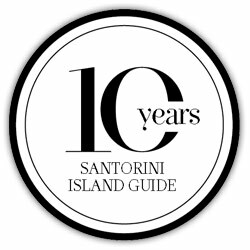 Highlight: Unique opportunity to visit an isolated chapel in a perfect Santorini setting. Plenty of music and local wine served. Info: The central high-steeple Church of Pyrgos is adorned with basil-filled pots with basil. According to the tradition, young males steal them from the yards and window-sills of girls to decorate the church on the feast day. Food: Besides fava, ‘tomatokeftedes’ (tomato balls) are also prepared and served by the women of the village. 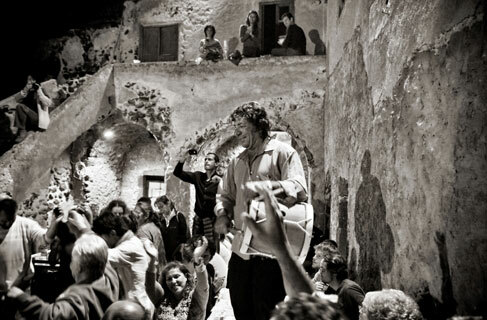 Highlight: A great island feast is held at night: live music and dancing, lots of white wine and a gift lottery. Info: This is the greatest church of the island dedicated to the most important religious feast of the Orthodox summer. 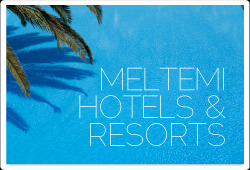 It is located in Mesa Gonia and you can easily find the way by following directions from Fira to Kamari. Food: On the eve, beans and fava are cooked in big caldrons. Highlight: The Church by itself is really worth visiting. Built by Emperor Alexios A Komnenos in the 11th century, it hosts the great icon of Sweet-kissing Virgin Mary (Panagia Glykofilousa), kept in a special glass case under controlled conditions. The view from the church yard is spectacular. 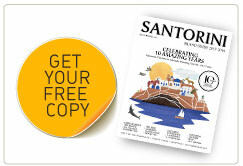 The greatest religious summer feast is celebrated in all villages of Santorini. If you prefer a chapel, Panagia Kalou in Pori is the ideal one. It was built around 1750 by the villagers as an offering to Virgin Mary for saving their animals and crops from toxic volcanic fumes. Info: The largest Church of Santorini is located below the imposing rock cliff of Mesa Vouno at the end of the Perissa village. Food: The menu includes fish, such as anchovy and scads, accompanied with plenty of wine. Highlight: It is real fun dancing barefoot on the dancing floor by the sea, while instruments continuously play traditional music. Info: The greatest religious feast of Kamari is held at a nice church in the centre of the village. The procession of the icon takes place around the alleys on the feast day. Food: The typical menu includes meat with potatoes and abundant local wine. Highlight: On the feast night, a special musical event is organised in the yard of the primary school. The flat floor of the yard is ideal for dancing. 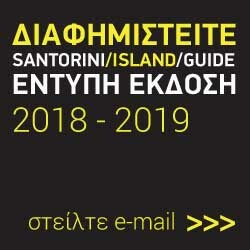 Info: Probably the most important ‘panigyri’ of the island. All locals are here. Built in 1859, the Saint Matrona Church is located at the eastern side of the central road in Finikia. 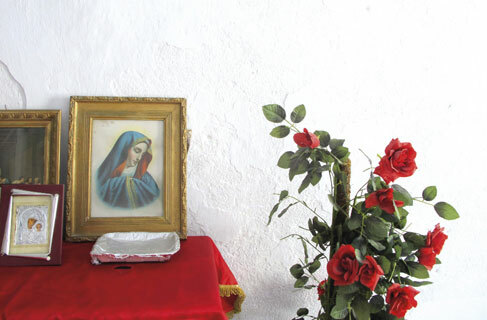 On the eve, the church is decorated with palm leaves and on the feast day the litany of the icon takes place around the alleys that have been paved with rosemary and sweet-scented pelargonium. Food: The menu is rich and delicious, including traditional codfish cooked with fresh onion, oil and boiled potatoes, along with a great variety of grilled meat and ‘gamopilafo’ (island wedding pilaf). Highlight: Squares around the church overflow with people having fun listening to traditional instruments and dancing.